SIZE: 1 GALLON POT: 6-8" H x 8-12" W - NICE! 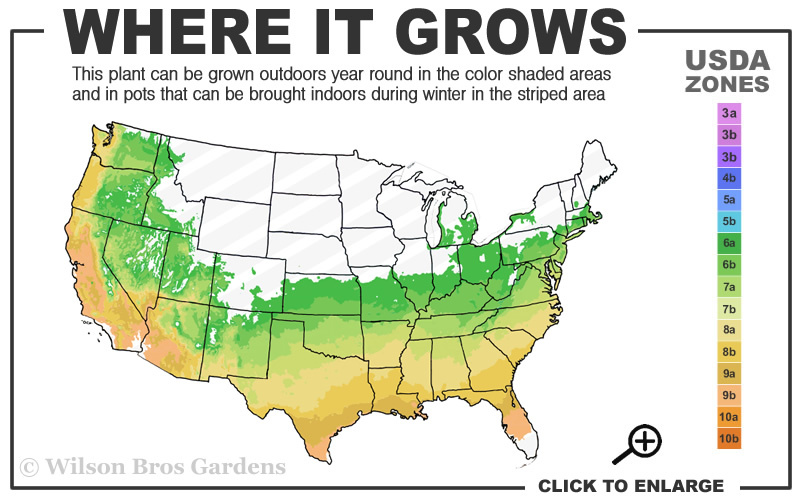 Note: For our customers who live and garden North of USDA Cold Hardiness Zone 6a, where this Plum Yew is not reliably winter hardy, you'll be happy to know it can be grown in containers that can be brought indoors during winter and placed back outside when temperatures warm up in spring. Creeping Plum Yew, Cephalotaxus harringtonia 'Prostrata', is an elegant plant with a spreading habit and attractive arching branches covered with glossy, flattened, very deep green needles that provide a very unique texture in the landscape. Will grow in heavy shade or full sun in USDA Zones 6 and 7 but likes a break from direct afternoon sun in in zones 8 and 9. 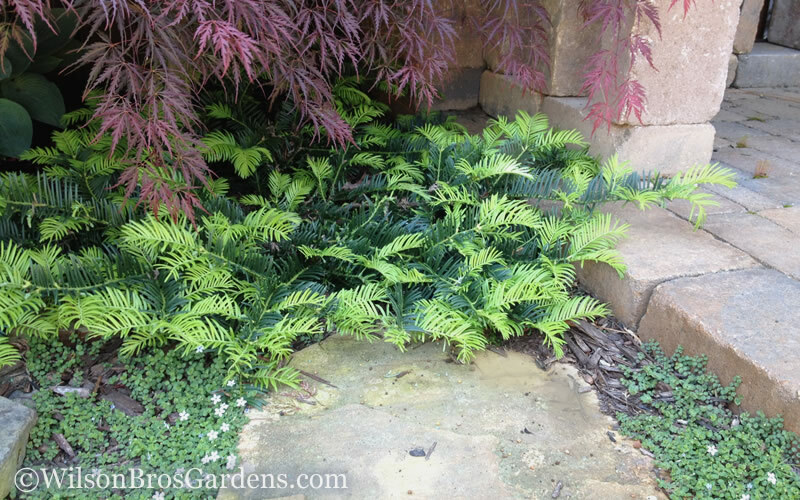 Anyway, we think this plant looks better in the shade and its unique foliage compliments all other plants in the shade garden. In case you were wondering, the word "plum" in the name comes from the purple-red fruits that are produced on female plants. 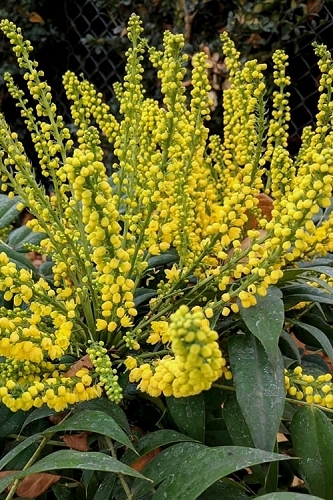 NOTE: So that those of you who are considering purchasing this plant from us will know what to expect when you receive and open the box, we took a picture of an average sized 1-gallon plant on our nursery and have posted it below. The plants we ship could be smaller or larger than the one pictured. This groundcover variety of plum yew is one that will never look as large and full growing in a container as it does in the ground. 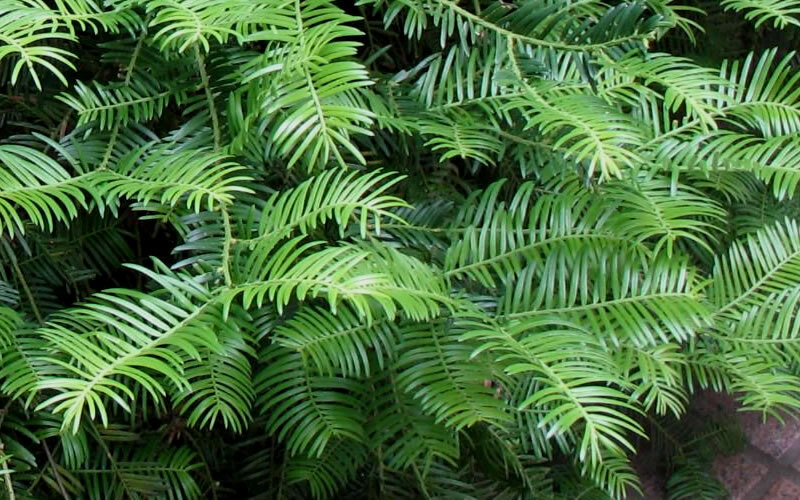 Once planted in the ground, the creeping plum yew will grow much more dense, reaching a height of 18-24 inches and a width of 3 feet or so. 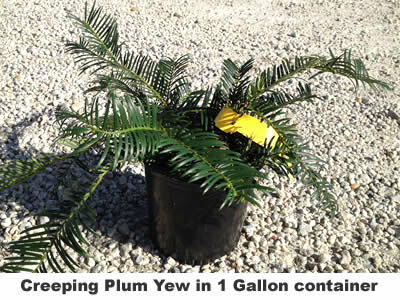 Creeping Plum Yew grows best in well-drained sandy soils but will adapt to any well-drained soil. Where climates are cool during summer it can be planted in full sun, but otherwise prefers some shade, preferably in the afternoon. 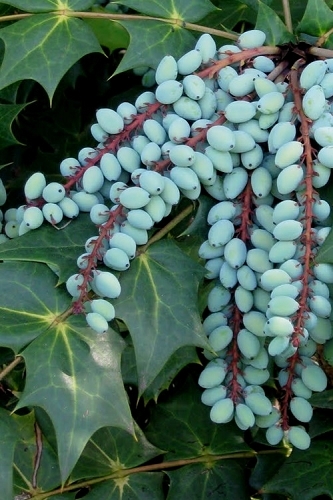 We've seen no serious disease or insect problems and it is a very deer resistant plant. Note: For helpful advice provided by our experts, click on the Planting & Care tab above on desktops and below on mobile phones. 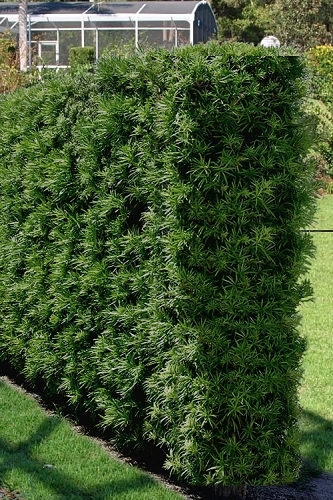 Click on the link below to get helpful advice from our experts on how to plant, fertilize, prune and water Plum Yews. I have been looking for this plant for over a month. The creeping yew came packed perfectly and all arrived in great shape and very healthy. They have a ton of new growth on them and they are still in the pot . VERY pleased with your personalized service to help me receive the exact plant I was seeking. It is EXACTLY what I wanted, and I plan to continue using your services. Fast shipping. Plants were well wrapped and protected. The individual plants were healthy, transplanted into beds with no loss in spite of a severe winter. The plant arrived on time and in excellent condition. I am very happy with the quality of the plant and service that I received. The plants were a little small but healthy and fully rooted in one gallon pots. Can not complain though because I couldn't find this plant anywhere else. 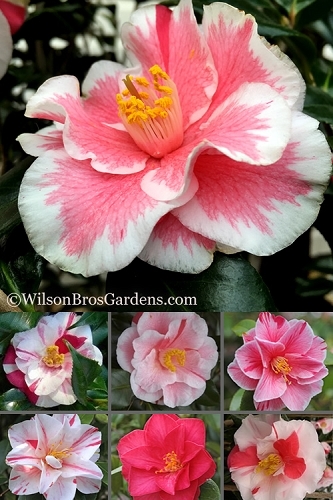 I talked to Spencer at Wilson Bros Gardens and he told me they do not grow full in pots but will fill out nicely when planted in the ground. Anyway, I am happy to have found them and will buy other plants from this nursery. 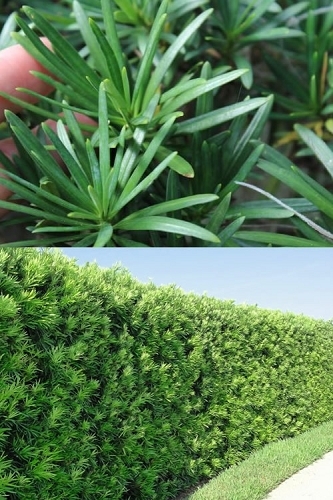 Q: I just ordered the creeping Japanese plum yew. 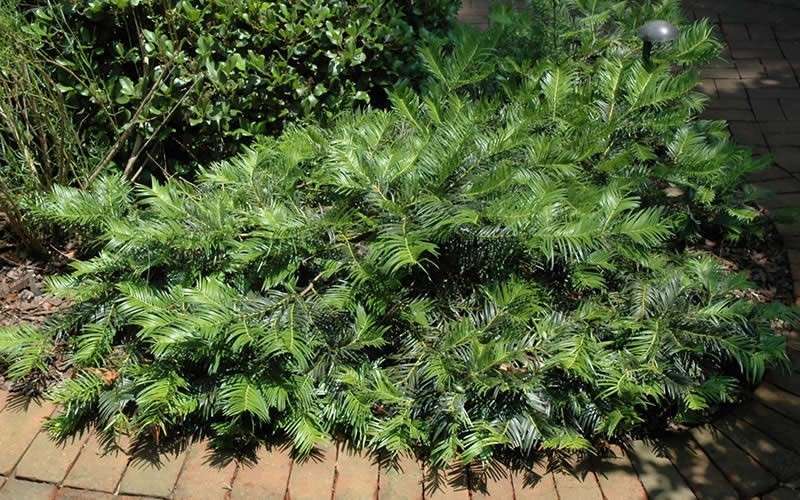 Since the Latin name is not visible, could you please confirm that this shrub is the same as the Cephalotaxus haringtonia prostrata? 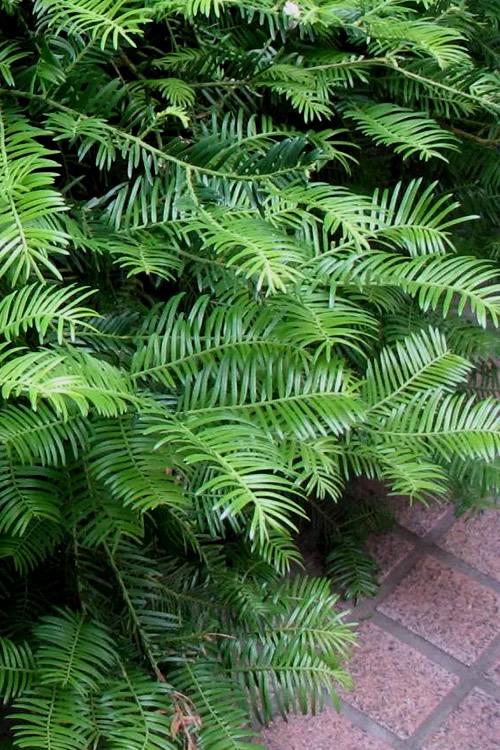 Yes, Creeping Japanese Plum Yew is Cephalotaxus harringtonia 'Prostrata'. Since you brought this to our attention, I went ahead and added the Latin name to the main name of the plant. 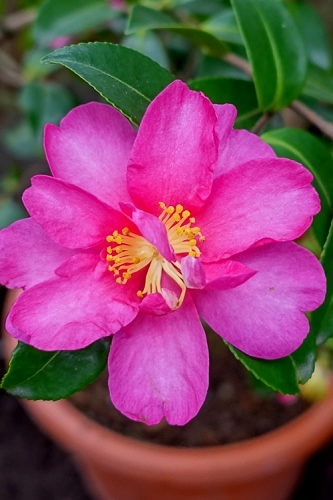 If you see other plants on the site that don't have the Latin name in the main name scroll down to the Description tab and you'll always find it there under the common name(s). Let us know if you have any other questions. We're at your service! 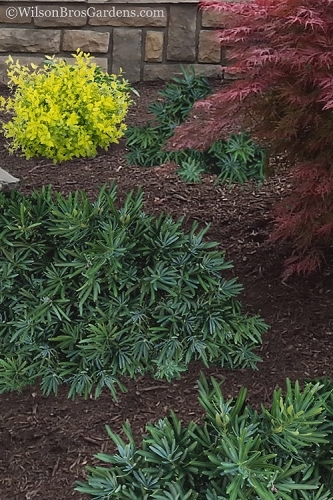 Click on the link below to find helpful advice from our experts on how to plant, fertilize, prune and water Plum Yews.